The Pamir Mountains are a mountain range in Central Asia at the junction of the Himalayas with the Tian Shan, Karakoram, Kunlun, and Hindu Kush ranges. They are among the world’s highest mountains, and since Victorian times, they have been known as the "Roof of the World", presumably a translation from Persian. In other languages they are called: Kyrgyz Памир тоолору Pamir Toolori; Persian: رشته کوه های پامیر‎‎ Reshte Kūh-hāye Pāmīr; Tajik: Ришта Кӯҳҳои Помир Rishta Kuhhoyi Pomir; Pashto: د پامير غرونه‎ Da Pamir Ghruna; Uyghur: پامىر ئېگىزلىكى Pamir Ezgizliki; Urdu: پامیر کوهستان Pamir Kuhestan; simplified Chinese: 葱岭; traditional Chinese: 蔥嶺; pinyin: Cōnglǐng; Wade–Giles: Ts'ung-ling or "Onion Range" (after the wild onions growing in the region). 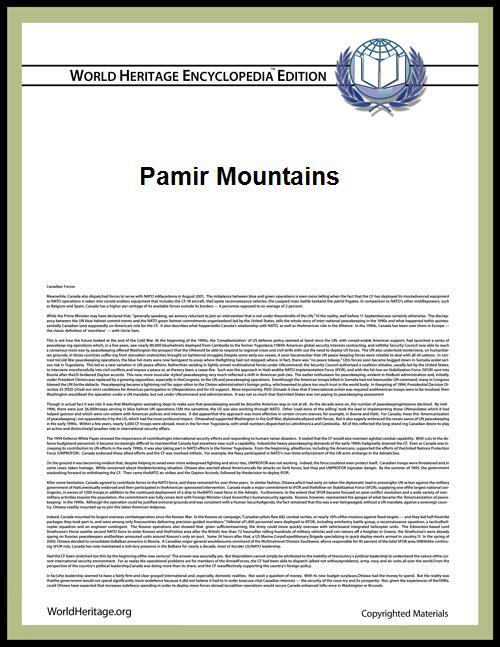 The name "Pamir" is used more commonly in Modern Chinese and loaned as simplified Chinese: 帕米尔; traditional Chinese: 帕米爾; pinyin: Pàmǐ'ěr. The precise extent of the Pamir Mountains is debatable. 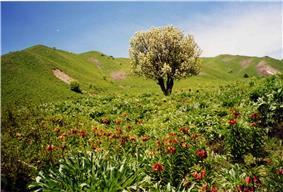 They lie mostly in Gorno-Badakhshan province of Tajikistan. 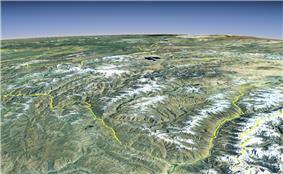 To the north they join the Tian Shan mountains along the Alay Valley of Kyrgyzstan. To the south they border the Hindu Kush mountains along Afghanistan's Wakhan Corridor. To the east they are generally considered to extend to the range that includes China's Kongur Tagh, a peak which is included in the "Eastern Pamirs"  more often than in the Kunlun Mountains, as Kongur Tagh and the Kunlun range are separated by the large Yarkand River valley; no valley of such significance separates the Pamirs and Kongur Tagh, just political boundaries. There are many glaciers in the Pamir Mountains, including the 77 km (48 mi) long Fedchenko Glacier, the longest in the former USSR and the longest glacier outside the Polar region. 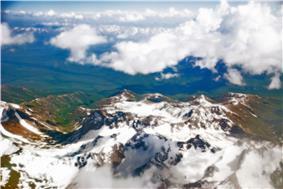 Part of the Pamir Mountain range in springtime. The East-Pamir, in the centre of which the massifs of Mustagh Ata (7620 m) and Kongur Tagh (Qungur Shan, 7578, 7628 or 7830 m) are situated, shows from the W-margin of the Tarim Basin an East-West extension of c. 200 km. 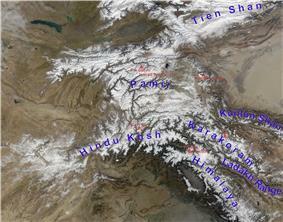 Its North-South extension from King Ata Tagh up to the North-West Kunlun foothills amounts to c.170 km. Whilst the up to 21 km long current valley glaciers are restricted to mountain massifs exceeding 5600 m in height, during the Last Glacial Period the glacier ice has covered the high plateau with its set-up highland relief, continuing west of Mustagh Ata and Kongur. From this glacier area an outlet glacier has flowed down to the north-east through the Gez valley up to c.1850 m asl and thus as far as to the margin of the Tarim basin. This outlet glacier received inflow from the Kaiayayilak glacier from the Kongur-north-flank. 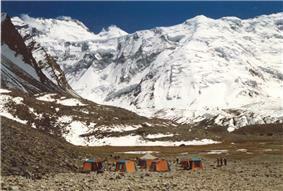 From the north-adjacent Kara Bak Tor (Chakragil, c. 6800 or 6694 m)-massif the Oytag valley glacier in the same exposition flowed also down up to c. 1850 m asl. At glacial times the glacier snowline (ELA) as altitude limit between glacier nourishing area and ablation zone, was lowered about 820 to 1250 altitude metres against today. Under the condition of comparable proportions of precipitation there results from this a glacial depression of temperature of at least 5 to 7.5 °C. 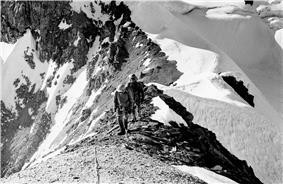 Expedition in 1982 to Tartu Ülikool 350 Peak, that was considered to be the highest unreached peak in the territory of former Soviet Union at the time. The the Earl of Dunmore, Wilhelm Filchner and Lord Curzon who was probably the first to reach the Wakhan source of the Oxus River. In 1891 the Russians informed Francis Younghusband that he was on their territory and later escorted a Lieutenant Davidson out of the area ('Pamir Incident'). In 1892 a battalion of Russians under Mikhail Ionov entered the area and camped near the present Murghab. In 1893 they built a proper fort there (Pamirskiy Post). In 1895 their base was moved to Khorog facing the Afghans. ^ Encyclopedia Britannica 11th ed. 1911: PAMIRS, a mountainous region of central Asia...the Bam-i-dunya ("The Roof of the World"); The Columbia Encyclopedia, 1942 ed., p.1335: "Pamir (Persian = roof of the world)"; The Pamirs, a region known to the locals as Pomir – “the roof of the world". ^ , pp. 13-14Social and Economic Change in the Pamirs, by Frank Bliss, Routledge, 2005, ISBN 0-415-30806-2, ISBN 978-0-415-30806-9: Pamir = a Persian compilation of pay-I-mehr, the "roof of the world". ^ Kuhle, M. (1997):New findings concerning the Ice Age (LGM) glacier cover of the East Pamir, of the Nanga Parbat up to the Central Himalaya and of Tibet, as well as the Age of the Tibetan Inland Ice. 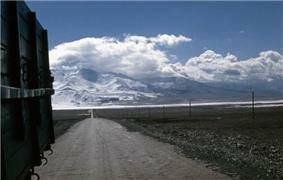 Tibet and High Asia (IV). Results of Investigations into High Mountain Geomorphology. Paleo-Glaciology and Climatology of the Pleistocene. GeoJournal, 42, (2-3), pp. 87-257. 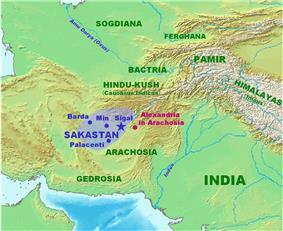 ^ Kuhle, M. (2004):The High Glacial (Last Ice Age and LGM) glacier cover in High- and Central Asia. Accompanying text to the mapwork in hand with detailed references to the literature of the underlying empirical investigations. Ehlers, J., Gibbard, P. L. (Eds.). Extent and Chronology of Glaciations, Vol. 3 (Latin America, Asia, Africa, Australia, Antarctica). Amsterdam, Elsevier B.V., pp. 175-199. Historically, the Pamir Mountains were considered a strategic trade route between Kashgar and Kokand on the Northern Silk Road and have been subject to numerous territorial conquests. The Northern Silk Road (about 2,600 km (1,616 mi) in length) connected the ancient Chinese capital of Xi'an over the Pamir Mountains towards the west to emerge in Kashgar before linking to ancient Parthia. In the 20th century, they have been the setting for Tajikistan Civil War, border disputes between China and Soviet Union, establishment of US, Russian, and Indian military bases, and renewed interest in trade development and resource exploration.